I’m chalking up the entire mess in the kitchen to the fact that we never lived in a home with a dishwasher until 2008. It’s not that I wouldn’t have made the same mistake if I had spent my whole life with a dishwasher. It’s just that I’d have learned my lesson by the time I was 14, rather than having to wait until 65. Here’s what happened. I poured the wrong soapy liquid into the detergent dispenser. I realized my error before I was through pouring, but couldn’t figure out how to remove the soap without sucking it out through a straw. And at 10:30 p.m. I wasn’t feeling especially creative. “I wonder what will happen,” I said to my husband after making my confession. “Probably not much,” he answered. When I got there I was reminded that he is a master of the understatement. 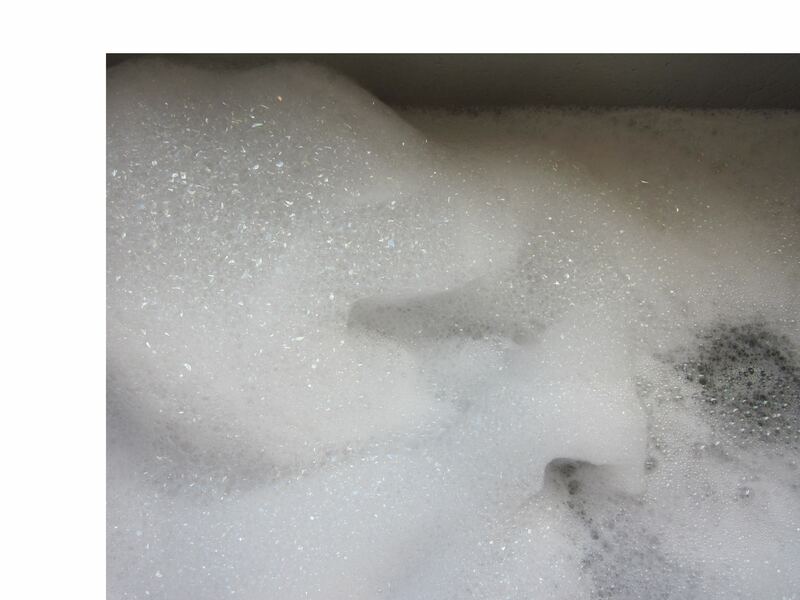 The water on the floor came from cascading sheets of liquid soap bubbles flowing out of one side of the dishwasher. We weren’t certain what would happen if we opened the dishwasher mid-cycle, but we could see what would happen if we didn’t. The image created by this act changed immediately from soapy waterfall to winter wonderland, like someone had vigorously shaken a snow globe. In the lower rack, the bowls set against the outer rim and plates closer in created a ski jump diorama. When we pulled the rack out of the dishwasher, icebergs emerged behind it. The winter image reverted back to a bathtub scene when I started grabbing clumps of soap, which required submerging my hands in hot water. We pulled out and rinsed the plates and bowls before deciding on next steps. We couldn’t remove all the soap, especially the layer stuck to the bottom of the upper rack that held the cups, so we proceeded to run the wash cycle one more time. At midnight, we gave up waiting for the wash to finish and went to bed. The next day I found a new home for the detergent that goes in the pump behind the sink. This entry was posted in humor and tagged a mess in the kitchen, using wrong detergent. Bookmark the permalink. We’ve all had experiences like that, though it’s usually because our kids were the cause. The good news is you only do it once! Such a mess to clean up and the bubbles seem to never end. I have heard that adding vinegar to the foamy mess cuts the bubble production. Ann, You need a wet and dry shop vacuum for such excitement — just remember if you get one or have one and didn’t think to use that when used for vaccuming wet substance you must remove the filter before doing so. You event just proves that we learn something new everyday, n’est-ce pas? At least you know where to put the detergent. My Mom at 91 with dementia has forgotten that she uses dishwasher detergent and uses dishwashing soap and puts it in the Jet Dri dispenser. Then she puts the dishwasher detergent in the empty bottle of washing machine soap. Labels be damned!